First cut a 6" x 9 1/2" piece of Stampin' Up! Melon Mambo card stock and fold in half for the base, a 4 1/2" x 5 3/4" piece of Stampin' Up! Elegant Eggplant for the middle layer, a 4 1/4" x 5 1/2" piece of white for the front, a 2 1/2" x 3 1/4" piece of Melon Mambo for the image's first layer, a 2 1/4" x 3" piece of white for the image, a 1" x 2 1/4" piece of Melon Mambo for the sentiment's background and a piece of 3/4" x 2" piece of white card stock for the sentiment. 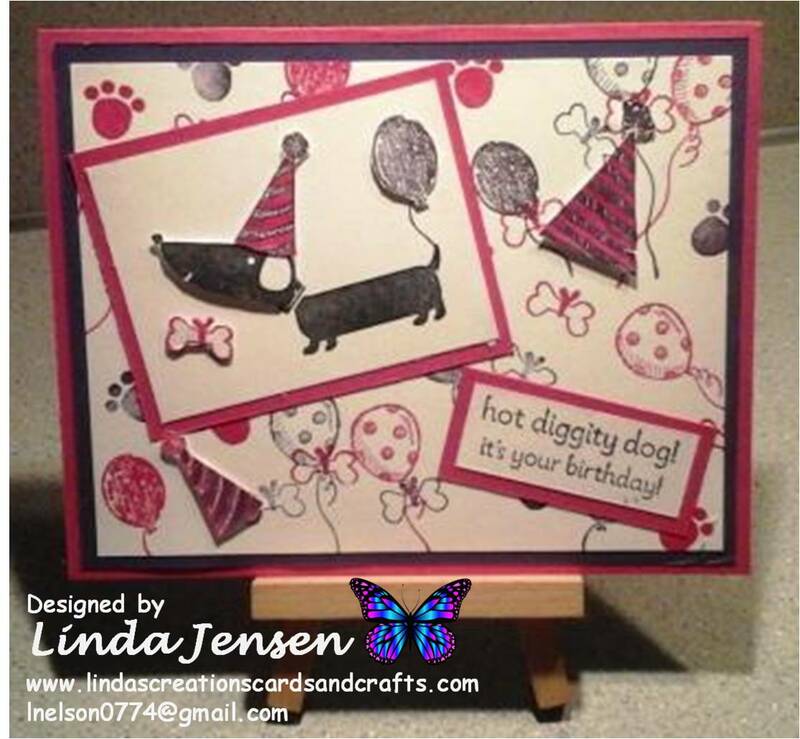 Next randomly stamp the bones with the stamp from the Hot Diggity Dog set, the balloons w/dots from the Stampin' Up! Sketched Birthday set, the solid balloon from the Birthday Surprise set, and the paw print with the stamp from the Bear Hugs set in Melon Mambo and Elegant Eggplant inks and set it aside. Then using a Stamp a ma jig, stamp the dog's body in Stazon Jet Black ink on the 2 1/4" x 3" piece of white card stock then on a separate piece of white card stock stamp the head in Jet Black, bone in Melon Mambo, and party hat and balloon in Elegant Eggplant inks and cut them out. Color the dog's party hat with a blender pen and Melon Mambo ink. Next attach them to the dog with mini pop dots, attach the dog's white card stock to it's Melon Mambo background then attach it to the front. 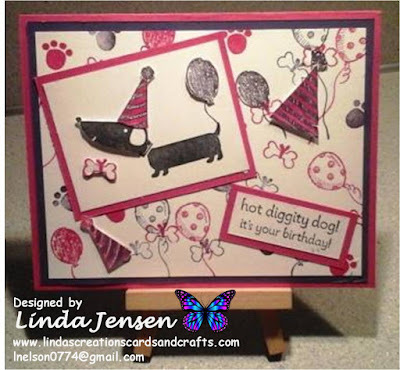 Then on another piece of white card stock stamp both the small and large party hats in Elegant Eggplant ink with stamps from the Birthday Surprise and Sketched Birthday sets, color them with a blender pen and Melon Mambo ink, cut them out and attach them to the front with mini pop dots. 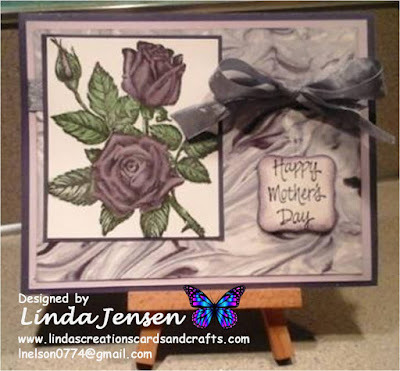 Next using a Stamp a ma jig stamp the sentiment on the 3/4" x 2" piece of white card stock in Elegant Eggplant ink then attach it to it's Melon Mambo background then to the front. Then attach the front to the Elegant Eggplant middle layer then to the Melon Mambo base and enjoy!